An AFL Evolution is coming in 2017 when the AFL and the AFL Players’ Association release an exciting new video game featuring the best male players from the Toyota AFL Premiership Season. AFL Evolution is currently in production with AFL licensee Tru Blu Entertainment and in conjunction with Wicked Witch Software. It will be available on next generation consoles PlayStation 4, Xbox One and PC Steam. Due for release in the first half of 2017, AFL General Manager Commercial Operations Darren Birch acknowledged the importance of video games as a tool to enhance entertainment for fans. “It’s no secret that the youth market is highly engaged with a variety of digital brands and properties. So for some time the AFL has identified a need to create a new video game as another entertainment property for footy fans,” Mr Birch said. “AFL Evolution will deliver a unique experience for footy fans, taking them to the heart of the action in a virtual footy world. “The AFL is dedicated to supporting Tru Blu Entertainment and Wicked Witch Software in creating a game that is fun to play for AFL fans and keen gamers alike,” he said. AFL Players’ Association General Manager – Commercial, Marketing and Communications Rebecca Chitty said the players were thrilled to deliver this exciting product to the fans. “This generation of AFL footballers grew up playing video games and this is an opportunity to feature in one that’s sure to have footy fans highly engaged,” Ms Chitty said. “Digital is an ever evolving space and the players see this as just another way to grow the game by reaching out to new audiences and showcasing it on different platforms,” she said. In the development of AFL Evolution, AFL players participated in photo shoots taking place at all 18 AFL Clubs with no less than 24 cameras used to simultaneously photograph the players in order to create highly detailed likenesses within the game. 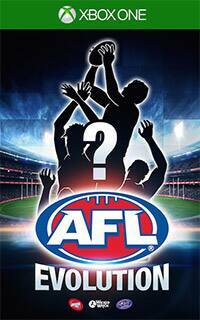 Fans excited to be involved in the game can take part in an online poll via AFL.com.au to decide on the players who will lead the next AFL Evolution and feature on the game’s cover from today until Thursday December 22. Ed. We are hoping that International Cup teams will again be featured as per the previous iteration of AFL video game from Wicked Witch. Tru Blu Entertainment is the video game publishing arm, of Home Entertainment Suppliers Pty Ltd (HES) who specialise in the distribution of games, video game consoles, and accessories throughout the Australian market and throughout the world. Established in 1984, HES are the exclusive Australian distributors of Playseat™ and Tru Blu Games. Tru Blu Games include Rugby Union, Rugby League and AFL franchises on both Microsoft and Sony Gaming Platforms. Wicked Witch is a provider of exceptional interactive games and applications of games technology and art. The team at Wicked Witch Software are united by a love of games. Wicked Witch Software is driven by creating engaging experiences that embrace and contribute to the science and art of digital games.